Here is an idea for a centerpiece for your Christmas table. I was surprised how easy it was to turn the 2-dimensional die cuts into a 3-dimensional project. 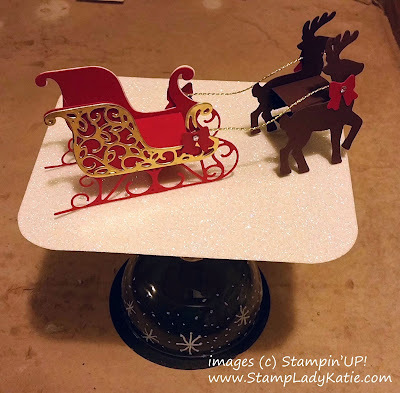 The idea for this project came when I discovered that Stampin'UP! 's chalk marker works on glass and its permanent! If you haven't played with Chalk Markers you really need to. I love this ornate Santa's Sleigh and reindeer dies, the dies look great on cards and scrapbook pages. Plus there's a matching stamp set! and you can save 10% when you buy them together as a bundle. Today's challenge - going from 2D to 3D. Once I figured out how to make the sleigh and reindeer stand up the project actually went together rather quickly, it just looks like it took a lot of time. And it gets a much appreciated "wow" from friends who see it. Hand drawn snowflakes made with Stampin'UP! 's Chalk Marker. Its permanent and doesn't wash off! To support the deer and the sleigh so they'd stand up, I used long 1" wide strips of paper, scored and folded to make an open rectangle. I found it needed a really strong adhesive to stay together, Stampin'UP! 's Fast Fuse worked well. The gold cord trim was held in place with glue dots and the little red bows hid the glue dots from view.